Spring is here, and for some fashion lovers like myself, it is hard to resist going on a spring shopping spree. If you are looking for a way to update your wardrobe for spring without spending a fortune, here are three ways to do so. You may not be able to afford several new shirts or skirts, but you may be able to afford several accessories. Invest in a few brightly colored scarves and spring statement jewelry. The right pieces can make a pair of jeans and tee shirt look like it came from a spring fashion catalog. Even a pair of floral leggings or bright leggings can transform the look of last year’s tunic or dress. Don’t underestimate the fact that little details can make a big difference. If you do buy a few spring pieces, you can make them look different every week by pairing them with something you already had in your closet. For example, a floral dress can worn with an old blazer or the dress can be worn as a skirt with an old shirt. If you look for fashion inspiration on Pinterest, you may be surprised that you have many of the pieces you need already in your closet. Another way to get a new spring wardrobe on a dime is to do some easy refashion projects. You can dye old pieces and give them a colorful spring look. For example, plain white canvas shoes can be dip dyed for a fun and unique look. With a pair of scissors and old tee shirts, you can make several fun pieces. Check out the seven easy shirt tutorials from LoveMaegan.com for spring inspiration. You can even buy a bleach pen for less than $2 and use it to make designs on black or navy tanks or shirts. The urge to splurge is hard to resist when every store updates their spring fashion lines. 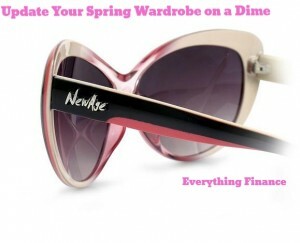 However, when you are on a tight budget, fashionable clothing is the last place you want to swindle your money away on. If you are going to splurge on a new piece of clothing this season, be sure to spend it on a piece that will remain in fashion for many seasons, such as a good pair of jeans or cropped summer jacket.